This study aimed to evaluate venous hemodynamic and morphological changes and associated factors in patients with Peripherally Inserted Central Catheters (PICCs), to provide evidence for rational clinical use of PICCs. Venography was performed at different time points in 87 patients with PICCs to observe hemodynamic, morphological, and structural changes. Related laboratory blood tests were also performed. Venous hemodynamic changes and structural abnormalities were observed in 77 patients following PICC placement, and blood tests showed significant changes. The effects of a PICC on hemodynamic and morphological changes are closely related to vein diameter, prothrombin time, fibrinogen level, and hemorheological parameters. Selection of larger peripheral veins and the use of measures that can modify hemorheological parameters, reduce fibrinogen level, and prolong the prothrombin time can reduce the incidence of PICC-related complications. Peripherally Inserted Central Catheters (PICCs) are widely used in clinical management, and there is increasing evidence of their efficacy , especially for chemotherapy in patients with cancer. However, with increasing use, PICC-related complications have been observed . One recognized complication is venous thrombosis , in particular Upper Extremity Deep Vein Thrombosis (UEDVT). The consequences of upper extremity venous thrombosis can be significant and include pulmonary embolism  and post thrombotic syndrome [5-8]. These catheters may also be complicated by infection, occlusion, fibrin sheath formation, and septicemia. The association between venous thrombosis and infection is well recognized, and serious infections can develop in patients with cancer [9-11], necessitating early catheter removal. PICCs are safe, convenient, and cost-effective, and are relatively simple to insert. All central venous catheters, including PICCs, have been implicated in UEDVT. The pathogenesis of thrombosis related to PICC is considered multifactorial , and is probably similar to that of other central catheters. Thrombosis related to PICC use is more likely to occur in patients with malignancy, especially those receiving chemotherapy. Randomized studies on venous thrombosis prophylaxis are needed in patients with malignancy, especially those receiving chemotherapy through PICCs. To understand the effect of a PICC on the veins and the basis for complications, altered physiology, and outcomes, and to provide evidence for the rational clinical use of a PICC and prevention of complications, we performed angiography and analysed relevant blood bioindicators at different time points in 74 patients with cancer with PICCs as well as in 13 asymptomatic patients from 2006 to 2015. Platelet count, prothrombin time, fibrinogen level, and hemorheological parameters were determined, in order to identify clinically effective measures for prevention and treatment of PICC-related complications. A total of 87 patients with cancer with PICCs were selected, including 35 males and 52 females, aged 35-78 y, with a mean age of 49 y. This study was conducted in accordance with the declaration of Helsinki. This study was conducted with approval from the Ethics Committee of Wuhan Central Hospital. Written informed consent was obtained from all participants. There were 41 cases of breast cancer, 13 of gastric cancer, 10 of lung cancer, 12 of colon cancer, 8 of liver cancer, and 3 of prostate cancer. The PICC sites were: 31 in the left upper extremity, 43 in the right upper extremity, 5 in the left internal jugular vein, 7 in the right internal jugular vein and 1 in the right external iliac vein. Indwelling PICC duration at angiography was: 0.5-2 h in 16 patients, 1-2 w in 13, and 2-18 months in 58, with an average of approximately 5 months; 21 patients were reexamined 3-6 months after removal of PICC. Among the patients with angiographic abnormalities, 20 exhibited ipsilateral limb pain and/or local swelling, and 57 were asymptomatic. Angiography of upper extremity, internal jugular, and lower extremity veins used routine X-ray apparatus for fluoroscopy and radiography, and the entire angiogram was organized as a single display; anteroposterior radiography was also performed. The deeper innominate vein, superior vena cava, inferior vena cava, and iliac vein were examined using Computed Tomography (CT), and laser images were printed for further analysis. Three catheter types were used: 16 cases had an infusion port, 53 had a BARD 4-F single-lumen PICC line, and 18 had a BD 5-F single-lumen PICC line. Platelet count, prothrombin time, fibrinogen level, and hemorheological parameters were tested in all patients. A Hitachi 500 Ma-X-ray machine and/or Toshiba TSX-003ACT were used with iohexol contrast for performing nonselective angiography. Upper extremity venography was performed in a 60-75º semi-supine position, with head higher than feet, according to individual physical differences; internal jugular and external iliac venography was performed in supine position. With the patient relaxed, a superficial vein on the dorsal hand or foot, or a vein on the lateral neck, was punctured for the PICC line, and 40 ml of iohexol containing 10 mg of dexamethasone was injected for full antegrade angiography of upper extremity and/or internal jugular veins (to the superior vena cava) or the external iliac vein (to the inferior vena cava) [13,14]. Nineteen patients underwent venography via the PICC after other catheters had been removed; within 1-2 w of PICC placement, 3 patients underwent simultaneous combined venography via the PICC line and another vein, 5 underwent simultaneous combined venography of the ipsilateral upper extremity and internal jugular vein in the supine position, and 21 underwent repeat venography 3-6 months after catheter removal. X-ray and/or laser photographs were evaluated in combination with blood tests to comprehensively analyse any abnormalities and their clinical significance. Venous morphological abnormalities caused by different PICC types and changes at different time points were recorded. The effects of PICC type and PICC duration were evaluated using single-factor analysis of variance. SPSS 19.0 statistical software was used, with P<0.05 considered statistically significant. Morphological abnormalities caused by PICC lines included venous thrombosis, venous occlusion, and combined thrombosis and occlusion. There were more cases of venous thrombosis, venous occlusion, and thrombosis plus occlusion with use of BARD type PICC lines (Table 1). There were significant difference in venous occlusion when BRAD compare with BD type (P<0.05). Meanwhile, there were significant difference in thrombosis and occlusion when BRAD compare with BD type (P<0.05). Table 1. The venous morphological abnormalities caused by different PICC types. Morphological abnormalities were assessed at 0.5-2 h, 1-2 weeks, and 2-18 months after PICC placement; there were more cases of abnormalities after 2-18 months than at other time points (Table 2). Table 2. The venous morphological formed at different time points. 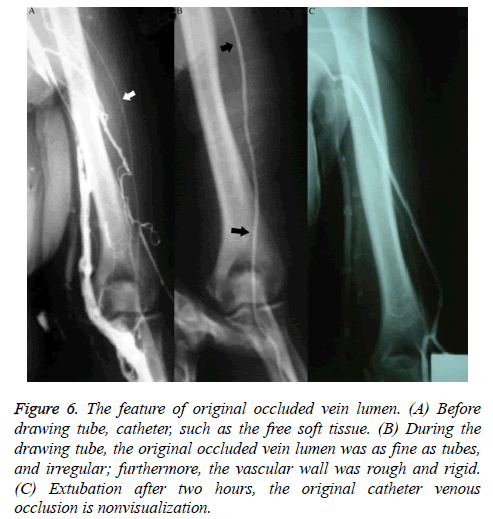 When venography was performed within 2 h of PICC placement, the findings using the PICC line were clear and complete, but the image findings with a direct venous approach were poor, and even suggested segmental venous obliteration in some cases; cases with endovenous filling defects were rare. The recanalization point at the proximal end of segmental venous obliteration had inflow branches (Figure 1); however, there was no obvious compensatory or collateral circulation in adjacent veins. 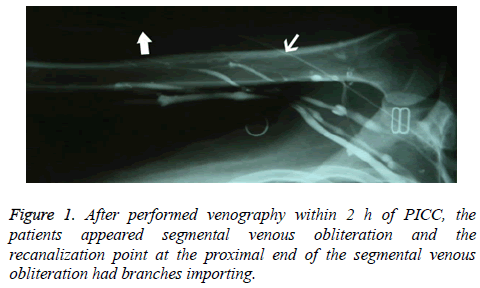 Figure 1: After performed venography within 2 h of PICC, the patients appeared segmental venous obliteration and the recanalization point at the proximal end of the segmental venous obliteration had branches importing. Patients who underwent venography within 1-2 w of PICC placement were those whose PICCs were discontinued for various reasons, including poor flow and limb abnormalities. Six patients had poor venous images with use of the upper limb PICC approach, and CT found thrombosis and partial severe luminal stenosis at the proximal mural end of the innominate vein and superior vena cava (Figure 2); 3 patients exhibited venous stem occlusion using the ipsilateral upper extremity PICC approach, thrombosis at the proximal end of the venous lumen, and significant compensatory expansion of shoulder and upper chest veins (Figure 3); 5 patients who underwent combined angiography of the internal jugular and ipsilateral upper extremity vein exhibited valve-like thrombosis in the proximal lumen of the innominate vein, which was joined by the common jugular and subclavian veins; jugular venous distension was observed with the PICC approach, with extravasation of contrast agent caused by blockage to central venous return and counter current flow from the puncture site (as well as mutual counter current flow with the subclavian vein), and significant compensatory enlargement of the cervical and thoracic vein branches (Figure 4); furthermore, the innominate vein was poorly imaged. Figure 2: CT scanning displayed the same patient (A) on the left side of the unknown venous thrombosis and unknown vein and luminal stenosis; (B) in the superior vena cava thrombosis and luminal stenosis. Figure 3: The patients exhibited left subclavian vein occlusion and left shoulder vein expand. Figure 4: Superior vena cava narrow entrance and expansion of internal jugular vein, venous extravasation and cervical vein regurgitation root expansion. Among patients who underwent venography within 2-12 months of PICC placement, only 4 showed no obvious abnormalities; the rest showed different degrees of vascular abnormalities. Among the patients with vascular abnormalities, those with venous occlusion exhibited different ranges of nondevelopment of the segmental vein lumen; angiography showed that the catheter seemed to be walking along the soft tissue; after PICC removal, angiography showed interruption of the development of certain branch veins with different lengths, as well as of interlinked branches at the distal and proximal ends of the occlusion (Figure 5). Figure 5: Occlusion in vein. (A) near side occlusion veins, (B) distal occlusion veins. The occlusion was more often seen in the superficial vein located at the inferior 2/3 of the upper arm, with 17 cases of cephalic vein occlusion, 21 of basilic vein occlusion, 13 of cephalic-brachial vein or basilic-brachial vein consecutive occlusion, 5 of subclavian vein occlusion, and 2 of left innominate vein occlusion. Fifteen cases of venous occlusion showed distal and/or proximal thrombosis, and 1 case of occlusion showed a tiny thrombosis in the adjacent communicating branches at the distal end of the occlusion segment, appearing as a small intraluminal filling defect. Patients with venous occlusion included 37 females and 21 males. During catheter removal, angiography performed with injected contrast agent showed that the original occluded vein lumen was irregular and as narrow as the catheter; furthermore, the vascular wall was rough and rigid (Figures 6A and 6B); 0.5 h after catheter removal, angiography showed complete occlusion and non-development of the original catheterized occluded vein. In addition to venous occlusion, the most important feature during this time period, in contrast to that observed in those who underwent venography within 2 h of PICC placement, was the increasing appearance of venous thrombosis. 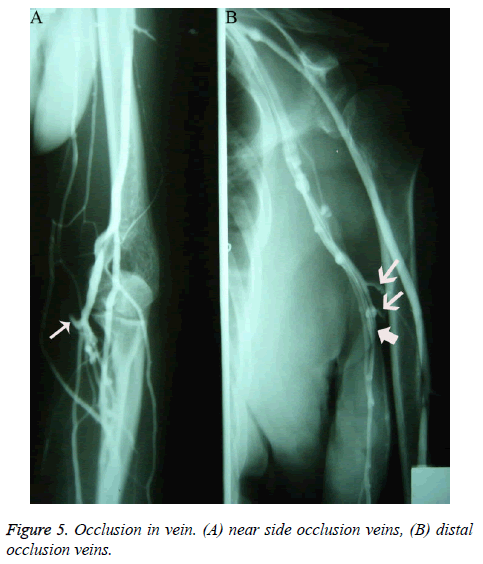 Patients with thrombosis exhibited various degrees and ranges of irregular intraluminal filling defects, luminal stenosis, and wall stiffness; lesions were more common in veins (such as the axillary vein) located in the upper 1/2 of the arm, especially near joints with greater activity. Patients with uncomplicated thrombosis were reexamined 2-6 months after catheter removal, but no significant luminal morphological changes were observed. X-ray follow-up showed that 10 patients with normal venography via the direct venous approach displayed significantly lower blood flow velocity than that in adjacent veins. The appearance of veins in patients without occlusion was characteristic: the diameter of the vein lumen was more than twice the outer diameter of the catheter. Figure 6: The feature of original occluded vein lumen. (A) Before drawing tube, catheter, such as the free soft tissue. (B) During the drawing tube, the original occluded vein lumen was as fine as tubes, and irregular; furthermore, the vascular wall was rough and rigid. (C) Extubation after two hours, the original catheter venous occlusion is nonvisualization. Patients without obvious venous abnormalities had lower than normal hemorheological values, platelet counts were below or within the normal range, the prothrombin time was prolonged, and fibrinogen was decreased or within the normal range. In patients with peripheral venous abnormalities, the hemorheological parameters, prothrombin time, fibrinogen, and platelets showed no obvious abnormalities; patients with thrombosis or occlusion in large veins had a decreased prothrombin time and/or increased fibrinogen, increased platelets, and increased hemorheological values. Venous stems in patients with different stages of occlusion, as well as the communicating branches between the occluded segments accessed via the catheter approach, were not visualized; however, the veins in the non-occluded segment and collateral circulation involving other stems in patients who underwent venography within 2-12 months of PICC placement were fully visualized (Figure 6C). PICC placement is an effective means of maintaining venous infusion, and is widely used in China and other countries, especially for cancer chemotherapy and nutritional therapy. The main approaches include catheterization via a superficial vein in an upper limb, followed by the subclavian and jugular veins; however, the approach via the femoral vein is rarely used. During PICC use in our hospital, symptomatic complications sometimes occur. To identify the causes, occurrence, and factors related to these complications, venography was performed at different time points in 87 patients after PICC placement; platelet count, prothrombin time, fibrinogen level, and hemorheological parameters were also evaluated. The results showed that the effects of a PICC on the veins were similar in two aspects. First, the effect of a catheter on hemodynamics was examined. The generation of hemodynamic effects synchronizes the process of catheterization, and is characterized by stability. Physical principles determine that as the catheter increases the intravenous surface area, the blood laminar flow is increased, and the adsorptive power of the vein and catheter wall for the blood is increased; meanwhile, the involvement of the catheter reduces the venous cross-sectional area, thus increasing the surface tension of the blood and resistance to blood flow, which is equivalent to significantly slowing the coherent venous flow velocity. Imaging performance then shows nonsynchronous contrast agent flow, which is significantly slower in catheterized compared to non-catheterized veins, resulting in weak development in early stages. The degree of reduction in blood flow is positively correlated with the outer diameter of the catheter [3,15,16], but negatively correlated with the vein diameter; in extreme cases, blood flow can be completely blocked. The results of comprehensive analysis during different periods show that the effects of catheters on hemodynamics are the main causes of peripheral vein occlusion, especially in early stages; peripheral vein occlusion is more synchronized with the catheterization process, and the occluded length is also closely related to the puncture site, i.e., the shorter the distance from the venous branch before the puncture point to the next merging site, the shorter the length of venous occlusion. The rate of venous occlusion in our study was about 75.3%, compared with a range of 57-85.7% reported in the literature [1,17-19]; however, this was a higher rate of occlusion, and may be associated with the higher rate of PICC complications in patients with cancer [9,10]. The turnover of vein occlusion is dependent on the catheterization time, and in patients with catheterization for more than 2 w, the venous occlusion will be irreversible owing to intravascular thrombus organization. Another effect is the physical damage on the vein wall caused by catheters, which begins at the time of catheterization, and shows progressive development; the extent of damage is positively correlated with the catheterization time, vein diameter, and activity near the catheterized site; however, unlike previous reports, the extent of damage was not obviously related to catheter texture , which may be explained by inconsistent catheterization periods among the patients in this study. The longer the catheterization time, the more obvious the intravenous pathological manifestations [3,20]; however, there were no significant proportional relationships, and not every patient showed pathological changes. The reason is that the longer the indwelling time, the more sustained the catheter’s physical effect on the vein wall, and the more severe the local damages; at sites with greater activity and thicker veins, the activity of the catheter is also greater, and the physical effects are also increased. The impact of this action affects related veins, but rarely exhibits a cascade effect toward adjacent branches; in this study, only 1 patient developed mild thrombosis at the confluence of the connected branches, and the images suggested that this phenomenon should have led to thrombosis in associated veins. This mechanism is an important cause of thrombosis in long-term catheterized veins and large vein occlusion (from the subclavian to the innominate vein). The closer to the heart the large vein occlusion, the more serious the symptoms and signs; because of the net-like effect of widely extended venous branches, the clinical manifestations will include prominent swelling of the ipsilateral limbs. Thrombosis shows no significant association with the puncture site; in early stages, thrombosis is more commonly seen near the puncture site, but occurs more commonly at joints in middle and advanced stages. The incidence of thrombosis in this study was 41.4%, which is higher than that reported in the literature (5.7-38.5%) [17,18,21,22]. In addition to the common features mentioned above, abnormalities shown in images in early catheterization stages (within 1 h) were mainly occlusions in related veins, indicating that hemodynamic change was the most important factor in vein occlusion. Local acute physical stimulation due to the catheter itself, puncture damage, and friction can result in local venous spasm, resulting in slow blood flow, which was a cause of early hemodynamic changes. The clinical manifestations were local pain at the puncture site and skin congestion. Such pathological changes, assuming a larger vein diameter, can become normal over time with appropriate catheter size, anticoagulation, and thrombolytic treatment; otherwise, damage would further evolve into permanent lumen occlusion until the venous wall becomes as stiff as a cord, which can be palpated and sensed on the skin, as well as tenderness in the early stages. Abnormal imaging in 13 patients who underwent venography within 1-2 w of PICC placement included filling defects caused by thrombosis near the output end of the catheter, proximal large vena cava occlusion, venous blood reflux, and high-degree venous rete expansion. The analysis based on the images and laboratory tests revealed that in addition to the physical damage caused by the catheter, these severe shortterm abnormalities were also closely related to hypercoagulable status (increased platelets, decreased prothrombin time, and increased fibrinogen), as well as the “two-high-one-low” status (high hemorheological parameters and low blood flow velocity); factors as a large angle in the venous approach, postoperative mediastinal blood vessel walking changes, dehydration, or diuretic use also had some impact. During this period, patient hemorheological values were high, the prothrombin time was decreased, and the fibrinogen level and platelets were increased, inducing a hypercoagulable state. Patients with an increased venous approach angle or with postoperative mediastinal changes often developed catheterization insertion occlusion, and angiography revealed intravenous valve-like behavior, similar to a pseudo-valve; the manifestations ranged from no abnormalities under normal conditions to venous engorgement during local catheter infusion; angiography can reveal the internal tortuosity and dilatation of the jugular vein, as well as endovenous counter current and extravasation of contrast agent at the catheter puncture site; after removal, the catheter proved to be intact using a water injection test. The pseudo-valve may be related to the intimal injuries caused by a blocked guidewire, and is more likely to be caused by the valve-like effects produced by the catheter terminal blockage-induced reentry, which is the result of venous tortuosity. Venous tortuosity can generate a local vortex, thus easily leading to thrombosis. Dehydration or diuretics can reduce the blood volume, thus greatly increasing blood viscosity; meanwhile, the vein diameter is narrowed, and the blood flow velocity is slowed, thus accelerating thrombosis in the veins. The imaging features of venous walls in patients with longterm catheterization (over 2 months) and laboratory features, such as lower hemorheological values and the absence of obvious abnormal routine coagulation changes were reviewed in patients with normal veins during this period and during early catheterization stages. It was obvious that catheter intervention was an external factor, and that hypercoagulable status is an inherent cause of hemodynamic changes; the external factor is the driving force, and the internal factor is the necessary condition, and these two factors co-induced vein occlusion. Chronic catheter friction-induced damage to the venous wall is a direct factor leading to a series of phlebitislike pathologies. There was no significant difference in thrombosis and occlusion incidence with use of either the BARD or BD catheter for upper arm venipuncture; this may be the result of inconsistent use of the catheters, with the clinical phenomenon mainly being peripheral venous occlusion. The complications caused by the infusion port mainly consisted of thrombosis and subsequent large vein occlusion, which were related to the puncture sites (primarily large veins such as the subclavian and the internal jugular). Peripheral venous occlusion generally does not produce symptoms or serious complications [22,23], which is also an important reason that PICC lines are widely used as they are rarely associated with adverse events. This study showed that vein changes after PICC placement are characterized by significant individual differences, thrombosis is more common in elderly patients, and venous occlusion is more common in female patients, in contrast with prior reports in the literature . These differences may be related to the fact that elderly patients have relatively stiffer venous walls, with poorer catheter tolerance, and may easily develop thrombosis; elderly patients are also more likely to have diabetes or hypertension, and are less active, resulting in a higher risk of thrombosis . Generally, women have more slender veins than men, and catheter intervention can lead to significant slowing of blood flow or even complete occlusion. In addition, this study also found that catheter texture had no significant effect on the rate and extent of damage ; this was not expected, and may be related to less use of the BD catheter; therefore, the differences between the catheters were not fully apparent. The longer the PICC catheterization time, the more obvious the thrombosis ; thrombosis was most obvious with a catheter duration of more than half a year. With regard to venous changes after PICC placement, there were no significant differences between the cephalic and basilic veins, in contrast with reports in prior literature . The finer the vein diameter, the greater the likelihood of peripheral vein occlusion after catheterization. PICC lines can injure the catheterized vein, but little significant harm can occur in a main vein stem due to the compensatory effects of collateral circulation; otherwise, the consequences may be serious. Patients with a hypercoagulable status and slow blood flow should not undergo PICC placement; frequent partial or complete blockage of the catheter after short-term use should prompt immediate PICC removal to avoid a fatal large vein occlusion; patients with mediastinal surgery should have PICC placement on the right side. Large veins with less tortuosity should be used for PICCs; use of a rational PICC time limit may reduce the risk of thrombosis and venous occlusion, and measures that can reduce hemorheological values and coagulation factors may also reduce the incidence of thrombosis. Further clinical studies are needed to validate these observations. Theoretically, severely ill patients may develop complications that lead to thrombus formation; however, research has not identified such phenomena [22-24]; this may be due to the fact that catheter-induced thrombus formation is multifactorial, and is the result of prolonged catheterization. Tian G, Zhu Y, Qi L, Guo F, Xu H. Efficacy of multifaceted interventions in reducing complications of peripherally inserted central catheter in adult oncology patients. Support Care Cancer 2010; 18: 1293-1298. Lobo BL, Vaidean G, Broyles J, Reaves AB, Shorr RI. Risk of venous thromboembolism in hospitalized patients with peripherally inserted central catheters. J Hosp Med 2009; 4: 417-422. Evans RS, Sharp JH, Linford LH, Lloyd JF, Tripp JS, Jones JP, Woller SC, Stevens SM, Elliott CG, Weaver LK. Risk of symptomatic DVT associated with peripherally inserted central catheters. Chest 2010; 138: 803-810. Owens CA, Bui JT, Knuttinen MG, Gaba RC, Carrillo TC. Pulmonary embolism from upper extremity deep vein thrombosis and the role of superior vena cava filters: a review of the literature. J Vasc Interv Radiol 2010; 21: 779-787. Prandoni P, Bernardi E, Marchiori A, Lensing AW, Prins MH. The long term clinical course of acute deep vein thrombosis of the arm: prospective cohort study. BMJ 2004; 329: 484-485. Maneval RE, Clemence BJ. Risk factors associated with catheter-related upper extremity deep vein thrombosis in patients with peripherally inserted central venous catheters: a prospective observational cohort study: part 2. J Infus Nurs 2014; 37: 260-268. Clemence BJ, Maneval RE. Risk factors associated with catheter-related upper extremity deep vein thrombosis in patients with peripherally inserted central venous catheters: literature review: part 1. J Infus Nurs 2014; 37: 187-196. Ong B, Gibbs H, Catchpole I, Hetherington R, Harper J. Peripherally inserted central catheters and upper extremity deep vein thrombosis. Australas Radiol 2006; 50: 451-454. Trerotola SO, Thompson S, Chittams J, Vierregger KS. Analysis of tip malposition and correction in peripherally inserted central catheters placed at bedside by a dedicated nursing team. J Vasc Interv Radiol 2007; 18: 513-518. Yap YS, Karapetis C, Lerose S, Iyer S, Koczwara B. Reducing the risk of peripherally inserted central catheter line complications in the oncology setting. Eur J Cancer Care (Engl) 2006; 15: 342-347. Grove JR, Pevec WC. Venous thrombosis related to peripherally inserted central catheters. J Vasc Interv Radiol 2000; 11: 837-840. Chen B, Xu L, Cheng J, He H, Kong Q, Yan Z, Xu X, Xiong S. Applied research of ct angiography of lower extremities by using 100 kvp and iodixanol (270 mg i/ml) combined with idose (4) iterative reconstruction technique. Zhonghua Yi Xue Za Zhi 2015; 95: 3833. Foster BR, Anderson SW, Soto JA. CT angiography of extremity trauma. Tech Vasc Interv Radiol 2006; 9: 156-166. Evans RS, Sharp JH, Linford LH, Lloyd JF, Woller SC. Reduction of peripherally inserted central catheter-associated DVT. Chest 2013; 143: 627-633. Mermis JD, Strom JC, Greenwood JP, Low DM, He J, Stites SW, Simpson SQ. Quality improvement initiative to reduce deep vein thrombosis associated with peripherally inserted central catheters in adults with cystic fibrosis. Ann Am Thorac Soc 2014; 11: 1404-1410. Abdullah BJ, Mohammad N, Sangkar JV, Abd Aziz YF, Gan GG, Goh KY, Benedict I. Incidence of upper limb venous thrombosis associated with peripherally inserted central catheters (PICC). Br J Radiol 2005; 78: 596-600. Allen AW, Megargell JL, Brown DB, Lynch FC, Singh H, Singh Y, Waybill PN. Venous thrombosis associated with the placement of peripherally inserted central catheters. J Vasc Interv Radiol 2000; 11: 1309-1314. Kim HJ, Yun J, Kim KH, Kim SH, Lee SC, Bae SB, Kim CK, Lee NS, Lee KT, Park SK, Won JH, Park HS, Hong DS. Safety and effectiveness of central venous catheterization in patients with cancer: prospective observational study. J Korean Med Sci 2010; 25: 1748-1753. Gunst M, Matsushima K, Vanek S, Gunst R, Shafi S, Frankel H. Peripherally inserted central catheters may lower the incidence of catheter-related blood stream infections in patients in surgical intensive care units. Surg Infect (Larchmt) 2011; 12: 279-282. Gonsalves CF, Eschelman DJ, Sullivan KL, DuBois N, Bonn J. Incidence of central vein stenosis and occlusion following upper extremity PICC and port placement. Cardiovasc Intervent Radiol 2003; 26: 123-127. Lee AY, Levine MN, Butler G, Webb C, Costantini L. Incidence, risk factors, and outcomes of catheter-related thrombosis in adult patients with cancer. J Clin Oncol 2006; 24: 1404-1408. Yi XL, Chen J, Li J, Feng L, Wang Y. Risk factors associated with PICC-related upper extremity venous thrombosis in cancer patients. J Clin Nurs 2014; 23: 837-843. Itkin M, Mondshein JI, Stavropoulos SW, Shlansky-Goldberg RD, Soulen MC, Trerotola SO. Peripherally inserted central catheter thrombosis-reverse tapered versus nontapered catheters: a randomized controlled study. J Vasc Interv Radiol 2014; 25: 85-91.